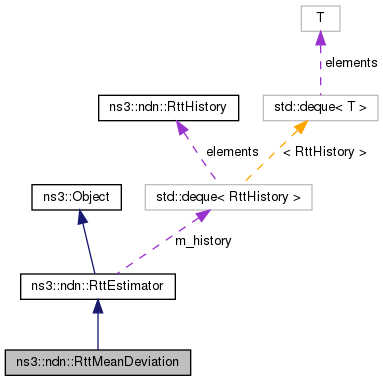 The modified version of "Mean--Deviation" RTT estimator, as discussed by Van Jacobson that better suits NDN communication model. Definition at line 47 of file ndn-rtt-mean-deviation.hpp. Definition at line 61 of file ndn-rtt-mean-deviation.cpp. Definition at line 67 of file ndn-rtt-mean-deviation.cpp. Definition at line 46 of file ndn-rtt-mean-deviation.cpp. Definition at line 77 of file ndn-rtt-mean-deviation.cpp. Note that a particular sequence has been sent. seq the packet sequence number. Definition at line 146 of file ndn-rtt-mean-deviation.cpp. Note that a particular ack sequence has been received. ackSeq the ack sequence number. The measured RTT for this ack. Definition at line 164 of file ndn-rtt-mean-deviation.cpp. References ns3::ndn::RttEstimator::m_history, Measurement(), and ns3::ndn::RttEstimator::ResetMultiplier(). Add a new measurement to the estimator. t the new RTT measure. 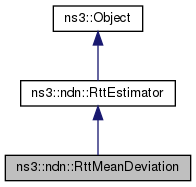 Definition at line 83 of file ndn-rtt-mean-deviation.cpp. Definition at line 106 of file ndn-rtt-mean-deviation.cpp. References ns3::ndn::RttEstimator::m_currentEstimatedRtt, ns3::ndn::RttEstimator::m_maxRto, ns3::ndn::RttEstimator::m_minRto, and ns3::ndn::RttEstimator::m_multiplier. Definition at line 121 of file ndn-rtt-mean-deviation.cpp. Resets the estimation to its initial state. Definition at line 128 of file ndn-rtt-mean-deviation.cpp. Definition at line 137 of file ndn-rtt-mean-deviation.cpp.